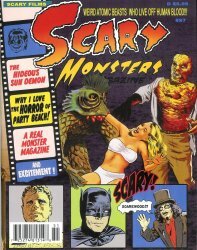 This is the Scary Monsters Magazine April 2015 issue #97 celebrating Weird Atomic Beasts Who Live Off Human Blood cover by Terry Beatty. Why I Love the Horror of Party Beach. Hormones, the scariest of them all. Why I love the hideous Sun Demon. Full color cover and vintage B&W content. 132 pages including cover.